The first time we took part in this annual event, we had already had several years of advance prepping. For example, we had this young man as an intern who was something of a birding wunderkind. Ben helped us determine whether our region of the Western Ghats was likely to appeal to birdwatchers. Short answer, yes. That same summer, 2012, Seth was in his second year working for the Lab of Ornithology and we could see that not only our company’s work but our own family was becoming more birdy, if not yet bird-nerdy. This year will be the best year yet for birding, and to prove it I am starting today to get ready for the next Global Big Day. I do not know where we will be that day, yet, but I am working on plan. May I suggest you do the same? Last May, more than 30,000 people took to fields and forests around the world, noting more than 7,000 species in a single day—Global Big Day. In less than 3 months, birding’s biggest day is coming back. Wherever you are in the world, you can be a part of birding’s next world record! On 4 May, will you join more than 20,000 others and become a part of Global Big Day? You don’t have to commit to birding for 24 hours—an hour or even 10 minutes of watching birds makes you part of the team. Visit your favorite spot or search out someplace new; enjoy a solo walk or get some friends to join in the Global Big Day fun. It’s been 5 years since we first began highlighting the Great Backyard Bird Count, a citizen science collaboration between the Cornell Lab of Ornithology, the Audubon Society and Bird Studies Canada. Since then, we’ve participated in 3 countries, on 2 continents, primarily in birding hotspots such as the Periyar Tiger Reserve in Kerala, India, a special corridor of avian biodiversity in the foothills of Poas Volcano in Costa Rica, and Baja California Sur, Mexico. The data that is collected by thousands of individual birders for eBird has long range benefits for monitoring both the health and range of particular species, as well as the state of the planet as species have to adapt to changing climate. For reasons I will need to write more about another time, Colombia has been on my radar recently. When I first visited that country, the conflict was in full swing and my only task was to give a series of lectures related to the country’s potential for nature-based tourism. And I remember very clearly my sense of responsibility for not creating false expectations: as long as there was conflict, this potential would remain just that. Millions of amateur naturalists around the world have been tuning in to the secret lives of albatrosses as New Zealand rangers employ YouTube in a bid to save the mysterious giant sea birds. It’s a relatively small world among the birding /photography community in India, and once I saw Gururaj Moorching’s photographs I reached out for an introduction to ask him to contribute to our Bird of the Day series. He started his own birding journey in 2012 after a trip to Kaziranga and another trip to the Rann of Kutch where he came across the two books “Birding on Borrowed Time” and “Lifelist” by the late Phoebe Snetsinger. We’ve been publishing his gorgeous photos for over 3 years, and I was thrilled when he shared his plan for a Photographic Birding Big Year. In our own way we’ve documented his birding travels within our series, and we applaud this amazing achievement of photo-documenting 951 of India’s 1,317 species of birds in just one year (2018). Gururaj is currently working on a book expected to be published this spring, but he recently spoke with Deepthi Sanjiv from the Bangalore Mirror about his experience. …Ornithologist Shashank Dalvi, India’s first birder to complete one ‘Big Year’ and record 1,128 species of birds in 2015, mentored Gururaj. He helped Gururaj list out travel plans to get maximum results and devised a calendar plan, based on the seasons and locations across India. “It is not a mean task to chase 1,317 species of bird found in India, including Adaman and Nicobar Islands. My love to travel, food and meeting new people made the journey interesting in this amazing country of huge diversity. Birding community in India is a well-knit family. I received great support from birders, guides and naturalists who were eager to share any information on bird movement and even opened their homes, kitchen and hearts to me. 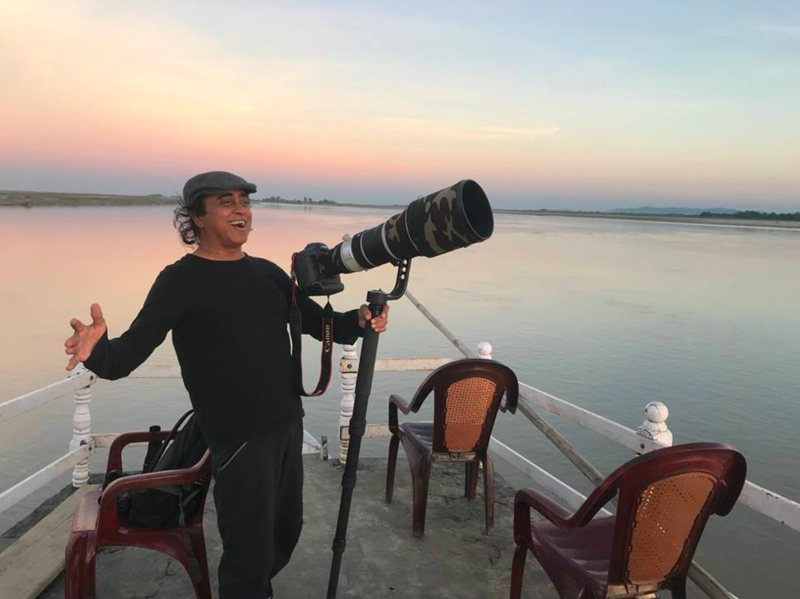 Rofikul Islam, a gifted naturalist from Kaziranga, stood by me throughout the year, and was the inspiration behind my decision to pursue a Photographic Big Year, which was the first of its kind,” said Gururaj. “A deep sense of contentment comes over me at the end of this sojourn,” he said. For the past several weeks, New Yorkers have been abuzz over a mysterious visitor. A mandarin duck, an intricately colored waterfowl native to East Asia, has taken up residence alongside the mallards in the Central Park Pond, drawing crowds and inspiring memes, dog costumes, and a Twitter account (bio: “I’m not from around here”). Pundits have argued that the frenzy betrays a desire for good news. But perhaps, the Mexico City-born designer Rebeca Méndez suggested the other day, something deeper is at play. “In our own normal life, we have patterns that we are so used to. When he’s at work, at the Tower of London, Yeoman Warder Christopher Skaife typically wears a uniform featuring a royal-blue tabard with scarlet ornamentation, a brass-buckled belt, and a bonnet. (Formalwear involves stockings and a ruff.) Skaife lives at the Tower, too, with his wife, in a house with forty-foot walls and arrow slits for windows. Skaife is the Tower’s Ravenmaster—his new book, “The Ravenmaster,” just came out—and in that role he cares for its most famous current residents, Merlin (a.k.a. Merlina), Erin, Rocky, Jubilee II, Gripp II, Harris, and Poppy, and gives tours to some of the Tower’s three million annual visitors. Recently, while vacationing in Manhattan, Skaife, who is Beefeater-shaped, with a bristly beard, was incognito, dressed in a zippered jacket and cargo shorts. He has tattoos on his calves depicting ravens, as well as, he said, “the skulls of those who were executed on the Tower Green.” On a crisp Friday, Skaife met up with his friend Gabriel Willow, a trim man in a cap, who works with New York City Audubon, to embark on a raven quest. More than a century ago, zoologist Joseph Grinnell launched a pioneering survey of animal life in California, a decades-long quest — at first by Model T or, failing that, mule — to all corners and habitats of the state, from Death Valley to the High Sierra. Ultimately Grinnell, founding director of the Museum of Vertebrate Zoology at the University of California, Berkeley, and his colleagues produced one of the richest ecological records in the world: 74,000 pages of meticulously detailed field notes, recording the numbers, habits and habitats of all vertebrate species that the team encountered. In 2003, museum scientists decided to retrace Grinnell’s steps throughout the state to learn what changes a century had wrought. And that’s why Morgan Tingley, then an ecology graduate student at the university, found himself trekking through the Sierra for four summers. Can You Top This Birding Experience? At an observatory in Quebec, they were hoping for a 50,000-bird day. They saw more than half a million. When I first read this article about the downstream problems of the pet trade, I was living in India and learning about efforts to reduce the poaching crisis of wild animals being transported eastward as well as westward. Florida seemed a long way away and the problem Bilger described was a crisis, for sure, but it bordered on sounding, for lack of a better term, exotic. And maybe worthy of closer observation? Almost four years ago, James and I took a day trip to Carara National Park, on the Pacific coast of Costa Rica where the tropical dry forest meets the moist rain forest in a transition zone that provides a great mix of habitats for all sorts of birds and other wildlife. On eBird, Carara’s Hotspot has over four hundred species, which made it a natural place for me to spend part of my Global Big Day this year, since I was already documenting the avian life on the property of the Los Suenos Marriott in Herradura, just half an hour south along the coast. These photos are from my May 5th efforts!